Which president holds the record for the most vetoes? Which president had the largest shoe size? Who was the only president to serve in both World War I and World War II? Who was the tallest president? These questions and many, many more are answered in The Smithsonian Book of Presidential Trivia. Divided into 11 chapters, The Smithsonian Book of Presidential Trivia looks at every aspect of our heads of state and presidential history: Citizens, Officers, Heroes, and Saviors; Stumping: From Front Porch to Facebook; The Pledge and the Parties; Inside the Oval Office; The Perpetual Podium; Home, Hotel, Parlor, Playground; First Families; Impeachment, Controversy, Shame; Assassination; Death, and National Mourning; Presidents in the Popular Imagination; and The Quotable President. Many of the questions are accompanied with photographs of artifacts from the Smithsonian's collections. 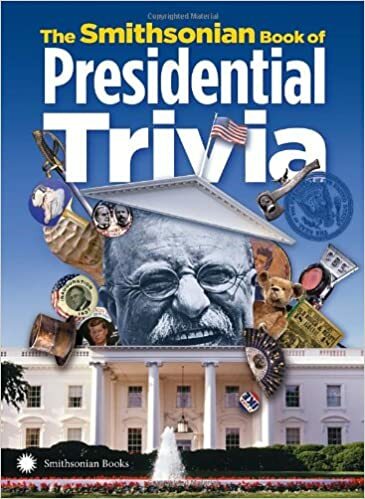 The Smithsonian Book of Presidential Trivia is sure to puzzle the trivia buff and presidential expert alike! and pulleys. Q: Which president was the first to have electricity in the White House? A: Benjamin Harrison. Electricity came to the White House as part of a plan for wiring the State, War & Navy Building next door. The Edison Company installed a generator for both buildings and wires were strung across the White House lawn and under the conservatory. Wires were buried inside the plaster walls of the rooms and round switches were installed for turning the current on and off. President and Mrs.